For other uses, see Kilkenny (disambiguation). Kilkenny (Irish: Cill Chainnigh, meaning "church of Cainnech") is the county town of County Kilkenny in the province of Leinster in south-east Ireland. It is built on both banks of the River Nore. The city is administered by a borough council (and a mayor), which is a level below that of city council in the local government of the state, although the Local Government Act 2001 allows for "the continued use of the description city". The 2016 census gave the total population of Kilkenny as 26,512. In 2009 the City of Kilkenny celebrated its 400th year since the granting of city status in 1609. Kilkenny is a tourist destination, and its environs include historic buildings such as Kilkenny Castle, St. Canice's Cathedral and round tower, Rothe House, Shee Alms House, Black Abbey, St. Mary's Cathedral, Kilkenny Town Hall, St. Francis Abbey, Grace's Castle, and St. John's Priory. Kilkenny is also known for its craft and design workshops, the Watergate Theatre, public gardens and museums. Annual events include Kilkenny Arts Festival, the Cat Laughs comedy festival and music at the Kilkenny Roots Festival. Kilkenny began with an early sixth century ecclesiastical foundation within the kingdom of Ossory. Following Norman invasion of Ireland, Kilkenny Castle and a series of walls were built to protect the burghers of what became a Norman merchant town. William Marshall, Lord of Leinster, gave Kilkenny a charter as a town in 1207. By the late thirteenth century Kilkenny was under Norman-Irish control. The Statutes of Kilkenny passed at Kilkenny in 1367, aimed to curb the decline of the Hiberno-Norman Lordship of Ireland. In 1609 King James I of England granted Kilkenny a Royal Charter giving it the status of a city. Following the Rebellion of 1641, the Irish Catholic Confederation, also known as the "Confederation of Kilkenny", was based in Kilkenny and lasted until the Cromwellian conquest of Ireland in 1649. Kilkenny was a brewing centre from the late seventeenth century, and still houses a number of breweries. The Heritage Council offices are at Church Lane. The seat of the Roman Catholic Bishop of Ossory is at St Mary's Cathedral and the Church of Ireland Bishop of Cashel and Ossory is at St Canice's Cathedral. Signatures of the Four Masters. Kilkenny is the anglicised version of the Irish Cill Chainnigh, meaning Cell/Church of Cainneach or Canice. This relates to a church built in honour of St. Canice on the hill now containing St. Canice's Cathedral and the round tower. This seems to be the first major settlement. The early Christian origin of the round tower suggests an early ecclesiastical foundation at Kilkenny. — Four Masters, Annals of the Four Masters, 1085. The Annals of the Four Masters recorded Kilkenny in 1085. Prior to this time the early 6th century territory was known as Osraighe, referring to the whole district or the capital. The Four Masters entry was the first instance where the capital was called Ceall-Cainnigh (modernized Kilkenny). Cill Chainnigh was a major monastic centre from at least the eighth century. There is no mention of Cill Chainnigh in the lives of Cainnech of Aghaboe, Ciarán of Saighir or any of the early annals of Ireland suggesting that Cill Chainnigh was not of ancient civil importance. Kilkenny's foundation began with an early sixth century ecclesiastical settlement, with a church built in honour of St. Canice. Now St. Canice's Cathedral, this was a major monastic centre from at least the eighth century. The Annals of the Four Masters recorded the first reference Cill Chainnigh in 1085. Prehistoric activity has been recorded, suggesting intermittent settlement activity in the area in the Mesolithic and Bronze Age. Information on the history of Kilkenny can be found from newspapers, photographs, letters, drawings, manuscripts and archaeology. Kilkenny is documented in manuscripts from the 13th century onwards and one of the most important of these is Liber Primus Kilkenniensis. The Kings of Ossory had residence around Cill Chainnigh. The seat of diocese of Kingdom of Osraige was moved from Aghaboe to Cill Chainnigh. Following the Norman invasion of Ireland, Richard Strongbow, as Lord of Leinster, established a castle near modern-day Kilkenny Castle. William Marshall began the development of the town of Kilkenny and a series of walls to protect the burghers. By the late thirteenth century Kilkenny was under Norman-Irish control. The original ecclesiastical centre at St. Canice's Cathedral became known as Irishtown and the Anglo-Norman borough inside the wall came to be known as Hightown. A remarkable early trial for witchcraft was that of Kilkenny resident Alice Kyteler (involving also her maidservant, Petronilla de Meath) instigated by the then Bishop of Ossory, Richard de Ledrede, in 1324. Charter of James I from 1609 which raised Kilkenny to a city with a mayor who is "to have a sword carried before him or them within the said city, and the county of the said city, at their will and pleasure, in such manner and form as is used in any other city or cities before any Mayor or Mayors within the said Kingdom of Ireland." The Kilkenny Design Workshops were opened in 1965 and in 1967 the Marquess of Ormonde presented Kilkenny Castle to the people of Kilkenny. Today, it has a lively cultural scene, with annual events including the Kilkenny Arts Week Festival in the last two weeks of August, and the Cat Laughs Comedy Festival at the beginning of June. Kilkenny is also where the Irish ale, Smithwick's, was first brewed. There is now a brewery tour on the foundations of the original brewery. Kilkenny is referred to as the Marble City, and people from Kilkenny are often referred to as 'Cats'. The seat of the Roman Catholic Bishop of Ossory is at St. Mary's Cathedral and the Church of Ireland Bishop of Cashel and Ossory is at St. Canice's Cathedral. Kilkenny is also the site of Ireland's earliest recorded witch trial. Occurring in 1324, the trial involved Dame Alice de Kyteler and her servant Petronella de Meath. Petronella would be the first person recorded in Ireland to be burned alive at the stake for witchcraft, after Dame Alice presumably fled the country. This trial was also one of the earliest recorded witch burnings in Europe, and inspires much folk lore about the possibility of the ghosts of Alice and Petronella haunting downtown Kilkenny. Alice's house, Kyteler's Inn, still stands, and is now a pub. The elevation is 60 metres (200 ft) above mean sea level. The area of Kilkenny borough is 3.74 square kilometres (1.44 sq mi). Kilkenny borough has a population of 8,591, however the majority of the population of Kilkenny live outside the borough boundary. Kilkenny City borough and its environs had a population of 22,179 in 2006. Changes as of the 2006 census, by the Central Statistics Office, Kilkenny Town Borough had a population of 8,661 which was an increase of 70 persons over the 2002 figure of 8,591 or 0.8%. The Town Environs had a population of 13,518 which was an increase of 1347 persons over the 2002 figure of 12,144 or 11.3%. Overall both the Borough & Environs had a population of 22,179 in 2006 which was an increase of 1444 persons over the 2002 figure of 20,735 or 7.0%. People from Kilkenny are often referred to as 'Cats'. Disposable household income per person as of 2005 was 18,032 euro and the index of disposable household was 89.4. It is multilingual but predominantly English-speaking, with Irish being the second most commonly spoken language. In recent decades, with the increase of immigration on an all-Ireland basis, many more languages have been introduced into Kilkenny. The main religion is Catholic, however there are Church of Ireland, Presbyterian, Methodist, Jewish and other religious traditions living in Kilkenny. Weatherwise, Kilkenny is generally representative of wide river valleys in the region with low temperatures on cloudless nights, and is significant in that it records some of the highest summer and lowest winter temperatures in Ireland. The highest air temperature ever recorded in Ireland was 33.3 °C (91.9 °F), at Kilkenny Castle on 26 June 1887. The Met Éireann Kilkenny Weather Observing Station, 2 km north-west of the centre of Kilkenny, on the Duningstown Road, opened in May 1957, and observations ceased in April 2008. A climatological station is currently in operation within 1 km of the old site, and as of March 2010, was providing live weather data to the general public and climate data to Met Éireann. Extremes recorded at the station include the highest air temperature of 31.5 °C (88.7 °F) on 29 June 1976, the lowest air temperature of −14.1 °C (6.6 °F) on 2 January 1979 and the lowest ground temperature of −18.1 °C (−0.6 °F) on 12 January 1982. The maximum daily sunshine was 16.3 hours on 18 June 1978. The maximum daily rainfall recorded at Kilkenny station was 66.4 millimetres (2.61 in) on 17 July 1983. The late 1950s and early 1960s were wet but rainfall had been steady throughout the century. 2002 was a very wet year and since 2005 annual rainfall has been increased steadily, with 2009 being the wettest year since records commenced in 1958. Kilkenny's first council was elected in 1231, and since then Kilkenny has had a continuous record of municipal government. From the 13th century to the end of the 16th, the chief magistrate was known as the sovereign, and since then as the mayor. 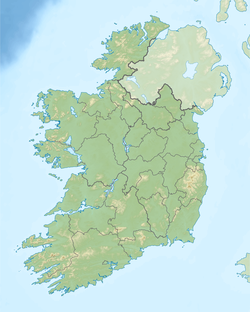 Kilkenny is a local electoral area of County Kilkenny and includes the electoral divisions of Dunmore, Kilkenny Rural and St. Canice. Local government bodies in Kilkenny have responsibility for such matters as planning, roads, sanitation and libraries. It is governed by the Local Government Acts, the most significant of which was in 2001, which established a two-tier structure of local government. The top tier of the structure consists of the Kilkenny County Council, which has 26 elected councillors, of which Kilkenny elects seven. The second tier of local government is the Kilkenny Borough Council, which is a "Town Council" but uses the title of "Borough Council" instead, but has no additional responsibilities. As of the 2009 local elections the composition of the town council is: Fine Gael 4, Fianna Fáil 4, Labour Party 2, Sinn Féin 1, Green Party 1. Kilkenny's city status is derived from a royal charter in 1609 by King James I of England. This was recently given a legislative basis by Section 10(7) of the Local Government Act 2001, which allows for "the continued use of the description city", although it does not have a "city" council like the other Irish cities, but rather a borough council instead. Kilkenny Borough Council, formerly Kilkenny Corporation, used to have a "sovereign" and "council of twelve", but these have since been replaced by a mayor and councillors respectively. County Kilkenny is in the South-East regional authority of Ireland and is part of the Carlow–Kilkenny Dáil Éireann constituency. Kilkenny has been represented through several parliamentary constituencies in the past. From 1918 to 1921, Kilkenny was part of the North Kilkenny United Kingdom Parliamentary constituency. In 1921 the Carlow–Kilkenny Dáil constituency was created and has stayed apart from between 1937 and 1948 when there was just a Kilkenny constituency. Kilkenny is in the South constituency of the European Parliament and elects 4 MEPs. The Landmarks of Kilkenny show Kilkenny's heritage through the historical buildings. Kilkenny is a well-preserved medieval town and is dominated by both Kilkenny Castle and St. Canice's Cathedral and round tower. Kilkenny Castle and some important historical architecture of the medieval city survive, like parts of the Kilkenny City Walls. They define the extent, layout and status of the medieval town. The town grew from a monastic settlement to a thriving Norman merchant town in the Middle Ages. Saint Canice's Cathedral and round tower are an example of the monastic settlement. Rothe House on Parliament Street is an example of an Elizabethan merchant townhouse located on the only completely surviving burgage plot in Ireland. It also features a restored 17th century garden on an area of half an acre behind the house, complete with herbs, vegetables and an orchard. The black stone with decorative white fossils that forms the backbone of many of Kilkenny's fine buildings was quarried locally, particularly from the quarry located 1.6 km south of the town on the R700. Kilkenny Marble was used for the plinth of the new tomb of Richard III in Leicester Cathedral in England. Visitor attractions in Kilkenny and its environs include Kilkenny Castle and Gardens including the Butler Gallery, St. Canice's Cathedral and round tower, Rothe House and Garden, Shee Alms House, Grace's Courthouse, St. Mary's Cathedral, Kilkenny City Hall, the Dominican Black Abbey, St. John's Church, Butler House, Kilkenny 'Slips' and St. Francis Abbey Brewery. Castle Park. 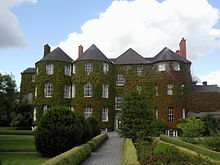 Gardens include the Castle Rose Garden, Rothe House Garden, the Famine Memorial Garden and the garden of Butler House. In the county other attractions include Kells Priory, Jerpoint Abbey, Dunmore Caves, Woodstock Estate and Jenkinstown Park. Kilkenny Marble or Black Marble was exported to all corners of the British Empire. The city has been referred to as the "Marble City" for centuries. Kilkenny Castle in Kilkenny city was the seat of the Butler family. (Formerly the family name was FitzWalter.) The castle was sold to the local Castle Restoration Committee in the middle of the 20th century for £50. Shortly afterwards it was handed over to the State, and has since been refurbished and is open to visitors. Part of the collection of the National Art Gallery is on display in the castle. There are ornamental gardens on the north west side of the castle, and extensive land and gardens to the front. It has become one of the most visited tourist sites in Ireland. The first stone castle was begun in 1204 by William Marshall the site was completed in 1213; it was a symbol of Norman occupation and in its original thirteenth-century condition it would have formed an important element of the defences of the town. There were four large circular corner towers and a massive ditch, part of which can still be seen today on the Parade. This was a square-shaped castle with towers at each corner; three of these original four towers survive to this day. Kilkenny Walls protected the medieval town of Kilkenny. The town was surrounded by walls with regular towers and gates. Remnants of the Town Walls survive such as Talbot Tower (1207), which is also known as Talbot's Bastion or Castle. It is the larger of the two surviving towers of the defences of the medieval High town of Kilkenny. There are walls on Abbey Street, and the adjoining Black Freren Gate is the only surviving gate/access remaining on the High town Circuit into the old city. A wall also runs through the brewery's grounds beside St. Francis Abbey. The Kilkenny City Walls Conservation Plan is a plan by the inhabitants of Kilkenny, Kilkenny Borough Council, the Department of Environment, Heritage and Local Government, An Taisce, The Kilkenny Archaeological Society and The Heritage Council to ensure the long-term survival of the city's walls. St Canice's Cathedral, also known as Kilkenny Cathedral, present building dates from the 13th century and is the second longest cathedral in Ireland. The Cathedral is named after Saint Canice, who also gave his name to the town. Cruciform, the cathedral was built in the Early English, or English Gothic, style of architecture, of limestone, with a low central tower supported on black marble columns. The exterior walls, apart from the gables, are embattled, and there are two small spires at the west end. The cathedral is seventy-five yards long, and its width along the transepts is forty-one yards. Beside the cathedral stands a 100 ft 9th century round tower. St. Canice's tower an excellent example of a well-preserved early Christian (9th century) Round Tower. Accessible only by a steep set of internal ladders, it may once have been both a watchtower and a refuge, and the summit gives a good view of Kilkenny and the countryside around. The hill on which the cathedral stands is believed to be the centre of the first major settlement at Kilkenny, and the round tower suggests an early ecclesiastical foundation. Dominican Black Abbey was founded in 1225, and lying just off Parliament Street. Kilkenny has four main bridges - Green's Bridge, John's Bridge, the Ossory Bridge and the St Francis Bridge. - and two pedestrian/cycle bridges - the Lady Desart Bridge and the Ossory Pedestrian Bridge . Each of the bridges spans the river Nore. Green's Bridge, also known as the 'Great Bridge of Kilkenny', is one of the four main bridges in Kilkenny and is an important element of the architectural, civil engineering and transport heritage of Kilkenny City. It was first built before 1200 and been called Green's Bridge since the Middle Ages. The bridge has been rebuilt many times since the twelfth century due to constant floods including the great floods of 1487 and 1763. The current bridge was built in 1766 after the 'Great Flood of 1763'. Green's Bridge crosses the River Nore in St. Canices Parish in the townland of Gardens. The present-day Green's Bridge was built by William Colles (c. 1710–70) in 1766 to designs prepared by George Smith (1763–67), a pupil of George Semple (c. 1700–82). The Classical-style detailing indicating the lasting influence of the Roman Bridge at Rimini as described by Andrea Palladio's (1508–80) in The Four Books of Architecture (1570) (I Quattro Libri dell'Architettura). Carved limestone of high quality stone masonry enhance the architectural design value of the bridge while the series of five elliptical arches identifies the civil engineering heritage significance of the bridge. The bridge was renovated in 1835 where parapets were added but alteration works carried out in 1969 removed one parapet and a steel railing was added. John's Bridge is one of four main bridges in Kilkenny spanning the River Nore it connects John Street to Rose Inn Street in Kilkenny city. It was first built after 1200 and has been rebuilt many times since the twelfth century due to constant floods including the great floods of 1487 and 1763. It has been called John's Bridge since the Middle Ages. The present-day John's Bridge was completed in 1910 and spans 140 ft (43 m) across the River Nore. It was reputedly, at the time it was completed, the longest single-span reinforced bridge in Ireland or Britain. The Design was by Mouchel & Partners using the Hennebique system of reinforcement. The arch consists of three ribs, tapering from 2 ft 6 in (0.76 m) to 2 ft (0.61 m) deep. The traverse deck beams are each 2 ft (0.61 m) deep. During the flood of 1763, people gathered on John's Bridge after Green's Bridge collapsed, John's Bridge whole structure collapsed and sixteen people died. The St Francis Bridge was opened on May 23rd 2017. It forms part of the Kilkenny Central Access Scheme. The scheme and the proposed building of the new bridge was the subject of major debate and protests in Kilkenny during 2014/2015. The Ossory Bridge, linking the ring-road, was completed in 1984. The Ossory Bridge features an inlaid sculpture. Lady Desart Bridge is a pedestrian/cycle bridge opened on Thursday, 30 January 2014. It links John's Quay and Bateman Quay and is located between John's Bridge and Green's Bridge. Lady Desart Bridge cost an estimated €600,000 to construct. The Ossory Pedestrian bridge, located underneath the main Ossory bridge, links the Canal Walk on one side of the River Nore to the Lacken Walk on the other side. The Old Woollen Mills was built in the 1800s and is located on the north side of the city, on the Bleach Road. It was one of the largest employers in the area; the site covers 100,000 square feet (9,300 m2) and has more than a mile of river frontage onto the Nore. Among its many features is the original 75 ft (23 m) chimney consisting of over 40,000 bricks. An architectural salvage and antique yard, Kilkenny Architectural Salvage, is currently located on the site. Kilkenny is a popular tourist destination in Ireland. Its art galleries, historic buildings, craft and design workshops, theatre, comedy, public gardens and museums are some of main reasons Kilkenny has become one of Ireland's most visited towns and a base from which to explore the surrounding countryside. Points of cultural interest in the area include Kilkenny Castle, St. Canice's Cathedral and round tower, Rothe House, St. Mary's Cathedral, Kells Priory, Kilkenny Town Hall, Black Abbey and Jerpoint Abbey. Kilkenny is a festival location throughout the year. Kilkenny Tradfest takes place over the St. Patrick's Day weekend in March and includes the St. Patrick's Day festivities, the parade and the Tradfest music festival, which highlights the best of Irish traditional and folk music. The Kilkenny Roots Festival is held on the first weekend of May and features Americana/Bluegrass/Folk/Rockabilly/AltCountry artists in various indoor venues throughout the city. Since 1998 the festival has attracted musicians from the Americana/Roots genre, including Calexico, Giant Sand, Ryan Adams, Alejandro Escovedo, Guy Clark, Chuck Prophet, Ray LaMontagne, Richmond Fontaine, Rodney Crowell, Phosphorescent, Sturgill Simpson and Alabama Shakes. Kilkenny hosts the annual Cat Laughs comedy festival every June bank holiday week. The Kilkenny Arts Festival established in the 1970s takes place in late August. During this time Kilkenny plays host to contemporary art, with theatre, dance, visual art, literature, film, painting, sculptures and live performances. Musical events, including traditional, classical, world music and jazz, take place during the festival. Savour Kilkenny is a food festival which happens in October every year, drawing tens of thousands of visitors. Each November, Kilkenny stages Kilkenomics, the world's first economics and comedy festival. Venues such as the Watergate Theatre host a range of home-produced and touring performances in dance, music and theatre. Music in Kilkenny is a rich and vibrant music scene with traditional Irish Music and artists such as Kerbdog, Engine Alley, R.S.A.G., My Little Funhouse and groups like Kilkenny Music. Many pubs have Irish traditional music sessions. Kerbdog was an Alternative rock band from Kilkenny who began writing in 1991. Engine Alley is a power pop band, who would go on to tour North America and Europe, having been signed to U2's Mother Records. R.S.A.G. 's double album Organic Sampler received a Choice Music Prize nomination for Irish Album of the Year 2008 in 2009. In 2005 Kilkenny Music a non-profit music-based group in Kilkenny was formed to work with a vast array of bands and acts within Kilkenny and the South East of Ireland. The Kilkenny Roots Festival takes place each May Bank Holiday weekend. The Kilkenny Arts Festival is held every August. A concert, 'Source', is held in Nowlan Park and has attracted musical performers such as Rod Stewart, Shania Twain, Bob Dylan, Paul Simon and Andrea Bocelli. Dolly Parton headlined at the 2008 event. Bruce Springsteen played 2 consecutive nights in July 2013 to finish the European leg of his World tour. Classical tastes are catered for in St Canice's Cathedral, where classical musicians and choirs often perform. The Kilkenny Choir and a Gospel Choir frequently perform in churches throughout the town. Groups like Ex Cathedra have played during the Kilkenny Arts Festival. Cleere's pub and theatre on Parliament Street is well known for touring Irish and international bands including indie, jazz and blues. They also have a traditional music session every Monday night, as does Ryan's on Friary Street on Thursdays. Kilkenny had a tradition of dramatic performance going back to 1366 when the Dublin company set up in Kilkenny. Henry Burkhead printed a play in Kilkenny, Cola's Fury, or Lirenda's Misery (1645), dealing with events of the Irish Rebellion of 1641 from an English standpoint. It was a blatantly political work with the Lirenda of the title being an anagram of Ireland. In 1642, as a result of the English Civil War, Dublin Royalists were forced to flee the city. Many of them went to Kilkenny to join a confederacy of Old English and Irish that formed in that city. In 1802 Sir Richard and Sir John Power of Kilfane established the Kilkenny Private Theatre. The Watergate Theatre in Kilkenny is a centre for the performing and visual arts. It provides a varied programme of professional and amateur dramatics, classical and contemporary music, opera and dance, together with regular exhibitions of paintings and photographs. The theatre plays an important role in the cultural, artistic and literary life of Kilkenny along with its festivals, professional and amateur theatre companies. The Set Theatre is also a smaller theatre located on John Street in Kilkenny. Award-winning animated studio Cartoon Saloon, as well as the Young Irish Film Makers and Mycrofilms, are all based in Kilkenny, which hosts Subtitle European Film Festival each November (since 2012). KCLR radio station serves Carlow and Kilkenny. It is based at both the Broadcast Centre on the Carlow Road, Kilkenny and Exchequer House, Potato Market, Carlow. KCLR is available on 96FM and is an independent local radio station. As of 2009, KCLR had 60% weekly reach and 33% weekday share. KCLR 96FM began broadcasting in May 2004 replacing Radio Kilkenny. Radio Kilkenny, which began as a pirate station Kilkenny Community Radio, received a licensed to broadcast to Kilkenny city and county on 96.0 MHz,96.6 MHz and 106.3 MHz in 1988. Radio Kilkenny had 63% of the radio listeners in County Kilkenny and 16% in County Carlow but failed to secure a franchise in 2003 when the Broadcasting Commission of Ireland changed the station's franchise area to include Carlow. The station ceased broadcasting at 2:10 a.m. on 1 January 2004. Beat 102-103 is a regional youth radio station broadcasting across the South East of Ireland. It serves a population of about 450,000, and in August 2006 it had a 49% share of the south east market. Newspapers have been produced in Kilkenny for centuries. Longstanding examples include Finns Leinster Journal (later the Kilkenny Journal) from 1767 to 1965, the Kilkenny People from 1916 to 1992, and the Kilkenny Moderator from 1814 to 1916. Other papers included the Leinster Independent from 1872; the Kilkenny Chronicle from 1813; the Kilkenny Courier; Tipperary Examiner from 1858; the Kilkenny Express and the Wexford Express from 1875; The Post (a sister paper to Kilkenny People) from 1926; the Kilkenny Standard from 1979, the Kilkenny People in 1895, the Kilkenny Voice (2005-2008) and also the Kilkenny Advertiser. Finn's Leinster Journal (1767–1801) was founded by Edmund Finn in 1767. It was published in Kilkenny but some content was relevant to Carlow. It was continued as Leinster Journal (1801–1830) and the Kilkenny Journal from 1832. The Moderator (1814–1822) changed its name to Kilkenny Moderator 1822–1919 and reverted to Moderator from 1920–1925. The modern Kilkenny People was first published in 1895. It is a weekly paper. According to the Audit Bureau of Circulations, the Kilkenny People had an average weekly circulation of 17,578 for the first six months of 2006. It is printed by the Kilkenny People Group at Purcellsinch and the group also publishes a number of other regional papers. Photographic Collections of Kilkenny include the Lawrence Collection c. 1900, the Crawford Collection c. 1940, the Valentine Collection c. 1950, the Bolton Street Students' Survey c. 1970, the Industrial Archaeologica Survey c. 1989, the Carrigan Collection and the St. John's Parish Collection, as well as many historical postcards. 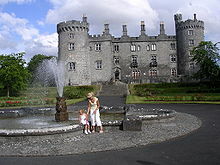 Kilkenny was named as the Academy of Urbanism European Great Town for 2008. The Academy Chairman, John Thompson, said "it is great to have an Irish town coming through in this year's awards, especially Kilkenny which is coming to terms with economic growth without losing its wonderful character and humour". Kilkenny won the Irish Tidy Towns Competition in 1985. Kilkenny is twinned with Moret-sur-Loing in France,  and Formigine in Italy. Instead of two cats there weren't any! Kilkenny is the home of many noted secondary schools, including the Church of Ireland Kilkenny College, founded in 1538. This is one of the oldest schools in the country, and its past pupils include Jonathan Swift and George Berkeley. A quote from an article "The Berkeley Pavilion" by Patsy Dempsey – Bishop George Berkeley (1685–1753) was one of the great philosophers of his time. He was born near Kilkenny and lived in Dysart Castle, Thomastown. Berkeley studied at Kilkenny College (now County Hall) from 1696–1700, where Jonathan Swift was a predecessor. St. Kieran's College was founded in 1782 and was the first Roman Catholic secondary school in Ireland. It was created after Grattan's Parliament which permitted some relaxation of the Penal Laws in the country. There are a number of other second level schools, including Loreto Secondary School, CBS Kilkenny, Coláiste Pobail Osraí, Presentation College and the Kilkenny City Vocational School. Other schools located in the rural areas of the county are Castlecomer Community School, Colaiste Mhuire Johnstown, Scoil Airigeal Ballyhale, St. Brigid's Callan, Grennan College Thomastown and Callan CBS. These also are noted for their focus on the games of hurling and camogie. Gaelscoil Osrai an Irish school in Kilkenny, is the 2nd largest Irish-only school in Ireland with around 450 from Junior Infants to 6th Class. Maynooth University maintained a campus at the grounds of St. Kieran's College from September 1997 until June 2018. The university offered the first year of full time arts degrees in Kilkenny, with students attending second and third year courses on the main campus in Maynooth. Kilkenny railway station opened on 12 May 1848. Kilkenny acquired railway links to Dublin in 1850, Waterford in 1854, Portlaoise in 1876 and Castlecomer in 1919. Córas Iompair Éireann closed the Castlecomer and Kilkenny Junction lines in 1962. Kilkenny railway station was renamed McDonagh Station in 1966 after the Irish nationalist, poet and playwright Thomas MacDonagh. Kilkenny remains an important stop on Iarnród Éireann's Intercity route between Dublin and Waterford. Unlike other countries, the location of railway stations in Ireland was closely related to military matters rather than trade or public transport. Kilkenny railway station is a fine example of this peculiarity, with Stephens Barracks being closely positioned to the railway station. From Kilkenny station trains run on the Dublin-Waterford line, providing connections in Waterford to Clonmel and stations to Limerick Junction. At Kildare connecting trains provide links to Ballina, Westport, Galway, Ennis, Ballybrophy, Nenagh, Limerick, Killarney, Tralee and Cork. Kilkenny Airport is only used for private flying. The nearest airport with scheduled services is Waterford Airport, which is 60 km away. A more substantial range of destinations is available from Dublin Airport and Cork Airport, which are both in the region of 150 km away. The city has a history of brewing and was home to St. Francis Abbey Brewery which was founded in the early 18th century by Messrs Cole and Smithwick. The Guinness Ireland Group owned this brewery from the 1960s. At the beginning of the 21st century, Guinness merged with Grand Metropolitan plc to form Diageo, the world's largest alcoholic beverage business, and the brewery became part of Diageo Global Supply. In its final years, Smithwick's Ale formed only a small percentage of production there. Another product was Kilkenny ale, a close relation of Smithwicks ale. Some 80% of beer produced at the brewery was Budweiser, a brand not owned by Diageo, but produced under licence. Diageo announced in May 2008 the closure of St. Francis Abbey Brewery, which took place on 31 December 2013. Production was then moved to St. James's Gate Brewery, Dublin. Kilkenny is also home to the head offices of Glanbia, one of the world's top dairy companies. Glanbia was formed by the merger of two dairy businesses: Avonmore and Waterford Foods and has interests in Ireland, the United Kingdom, the United States and more than 30 other countries. County Kilkenny Village Creameries amalgamated to create the Avonmore Creameries brand in 1966. That coop became Avonmore Food plc in 1988 and joined with Waterford Food plc in 1997. It is today known as the global Food giant, Glanbia, one of the world's top nutrition companies, with revenues of over €3.5 billion and 5,815 employees. In 1966 over 30 local creameries created by local farmers joined with other small rural co-operative societies throughout County Kilkenny and some neighbouring counties, and together with Unigate Limited support, formed the Avonmore Creameries Federation Realising the benefits of increased scale and greater diversification in the 1960s, they saw the need for an amalgamation of many small, locally focused co-operatives across Ireland. It led to the construction of a new multi-purpose Avonmore dairy plant facility in Ballyragget, County Kilkenny, a plant they claimed was the biggest food processing facility in Europe at that time. Today that giant global entity is known as Glanbia. Glanbia has its origins in the Irish agricultural co-operative movement that evolved over the last century, ever since first Irish Co-operative founded by Horace Plunkett in 1889. Today Glanbia has operations in 34 countries and is exporting to more than 100 countries worldwide. Glanbia is ranked by revenue (2010 figures) in the top 100 Cooperatives, No 98 in the world and No 1 in Ireland by the International Co-operative Alliance, the global apex organisation of co-operatives worldwide. According to the Glanbia Collections in Kilkenny Archives at St Kieran's College, Kilkenny, the Avonmore Coop brand was created through the merger of the following Village Creameries: Ballingarry Co-Operative Creamery Ltd., Ballyhale Co-Operative Creamery Dairy Society Ltd., Ballypatrick Co-Operative Creamery Ltd., Avonmore Creameries Ltd., Ballyragget Co-Operative Creamery Ltd., Bennettsbridge Co-Operative Creamery Ltd., Callan Co-op Creamery and Dairy Society Ltd., Castlehale Co-Operative Dairy Society Ltd., Castlecomer Co-Operative Creamery Ltd., Donaghmore Co-Operative Creamery Ltd., Dungarvan Co Waterford Co-Operative Creamery Ltd., Freshford Co-Operative Creamery Ltd., Glenmore County Kilkenny Co-Operative Creamery Ltd., Graiguecullen County Carlow Corn & Coal Co. Ltd., IDA Co-Operative Creamery Ltd., Kells, County Kilkenny Co-Operative Agricultural & Dairy Society Ltd., Kilmanagh, County Kilkenny Co-Operative Creamery Ltd., Kilkenny City Co-Operative Creamery Ltd., Leinster Milk Producers Association Ltd., Loughcullen County Kilkenny Co-Operative Creamery Ltd., Miloko Co-Operative Society Ltd., Knockavendagh & Moyglass Killenaule Co-Operative Creamery Society Ltd., Muckalee County Kilkenny Co-Operative Dairy Society Ltd., Mullinavat Co-Operative Creamery Society Ltd., Piltown Co-Operative Society Ltd., Slieverue Co-Operative Creamery Ltd., Shelbourne Co-Operative Agriculture Society Ltd., Windgap Co-Operative Dairy Society Ltd., Letterkenny Timber Co. Ltd., The Bacon Company of Ireland, Inch Creamery, Barrowvale, Goresbridge Creamery. The Ballyhale C.D.S. (1895–1995) 100th anniversary booklet of its foundation records that a federation of 25 Co-op Creameries originally emerged in January 1965 under the umbrella of Avonmore Creameries Ltd., that shares were taken in the new entity by the society and that in following years a Ballyragget milk processing factory was built. Ireland entered the Common Market in 1970. The first bulk milk collections tool place from 1973, when the amalgamation was formalised. Ballyhale C.D.S. became one of 20 members of Avonmore Farmers Ltd.; the other founding members being Castlehale, Mullinavat, Iverk, Piltown, Carrigeen, Kilmacow, Ballyragget, South Tipperary, Monastarevan, Muckalee, Barrowvale, Kells, Windgap, Brandonvale, Bennetsbridge, Castlecomer, Freshford, Donaghmore and Fennor. Recent developments in Kilkenny have attracted further investment from local businesses as well as attracting new industry. Leggetsrath Business Park was opened in 2003. There are two retail warehouse parks in Kilkenny: Kilkenny Retail Park and Ormonde Retail Park. Hebron Business Park was constructed in 2002 and is a privately owned extension to the Hebron Industrial Estate, the main centre for industry in Kilkenny. Hospitals in Kilkenny include three public hospitals and one private hospital. St. Luke's is a general medical and surgical hospital built in 1942. It is based on Freshford Road and provides a range of local and regional services. Local services include medical, general surgery, obstetrics, gynaecology and paediatrics. St. Canice's is a psychiatric hospital, opened in 1852 and located on the Dublin Road. It provides a range of mental health services including acute and long stay care, out-patient services throughout the county, addiction counselling services, respite care community hostel facilities and day care facilities. It also provides paediatric physiotherapy, and occupational therapy. Lourdes is the regional orthopaedic hospital outside the city in Kilcreene. Aut Even is a private hospital based outside Kilkenny City. The Kilkenny City Harriers Club is an athletics club formed in 1953. In 1989 Kilkenny was designated as a local sports centre and an all-weather running track and facilities designed to meet International Association of Athletics Federations standards was begun. In 1992 the new track was officially opened and renamed Scanlon Park after Patrick 'Rusty' Scanlon, who had been associated with the old complex both as an athlete and as a soccer player. The County Board of Kilkenny GAA (Irish: Cumann Lúthchleas Gael Coiste Cill Channaigh) has its head office and main grounds at Nowlan Park in the city. The Kilkenny branch of the GAA was founded in 1887. Hurling is the dominant sport in the city and county, and Kilkenny has one of the most successful county hurling teams. Secondary schools noted for their contribution to the game include St. Kieran's College and Christian Brothers School (CBS). Former students who have played for St. Kieran's include Eddie Keher, Brian Cody, Eoin Kelly, DJ Carey and Henry Shefflin. There are three GAA clubs based in the city: O'Loughlin Gaels GAA, Dicksboro GAA and James Stephens (GAA Club). St John's Parish is the catchment area for O'Loughlin Gaels. The parishes of St Mary's and St Canice's are associated with Dicksboro. St Patrick's parish is the catchment area for the James Stephens club. Gaelic football is also played in Kilkenny, although it is not as popular as it is in some other Irish counties. The Kilkenny footballers are the only county not to participate in the All-Ireland Senior Football Championship. They have previously taken gap years away from League football, and for example did not participate in 2013, after poor runs in 2012 and 2011. Kilkenny City AFC played in the League of Ireland until January 2008. It entered the league as EMFA in 1986, but resigned their position in the league after 22 years citing "lack of finance, poor results and paltry attendances". The club had spent all but two seasons in the League of Ireland's second tier. Kilkenny and District Soccer League run leagues at schoolboy, youths and junior level throughout the county. It is affiliated to Leinster Football Association, Football Association of Ireland and the Schoolboy's Football Association of Ireland. In 2015 Kilkenny United W.F.C. were admitted to the Women's National League, the top tier of women's football in Ireland. Kilkenny RFC founded in 1885, is a very strong and successful Rugby Union club based at Foulkstown on the Waterford Road. The club has provided many players for the Ireland team including Ernie Ridgeway, Bill Tector, Jack Notley, Willie Duggan, Ned Byrne, Ronan Kearney and Gary Halpin. Ian Dowling plays for the Munster Rugby team and is a two-time winner of the European Rugby Cup in 2006 and 2008. Jack Rafferty led the team to several notable victories in 1966. Rugby is played at schools level by Kilkenny College and Kilkenny Christian Brothers School (CBS). Kilkenny Golf Club is an 18-hole championship parkland course within the city to the North West, close to the city centre. It has hosted several Professional Championship events. In 1984 and 1996, it was the venue for the All Ireland Mixed Foursome Finals, and in 1985 hosted the All Ireland Cups and Shields Finals. It is playable all year round due to sand-based greens. The course is mostly flat terrain with an abundance of trees. Around Kilkenny City there is also a Driving Range in Newpark and an 18-hole all-weather Par 3 golf course in Pocoke. Mount Juliet Golf Course is a golf resort situated near Kilkenny in Thomastown. Jack Nicklaus designed the course, and it is considered to be one of Ireland's best courses. Kilkenny City Storm is a mixed ice hockey team formed in 2007. that plays in the Irish Ice Hockey Association Recreational Division League. "The Storm" was one of the top two teams in the league in 2007, its inaugural year. The team also enjoys moderate success as an inline hockey team, playing in the Northern Inline Hockey League and the Irish inline hockey (roller hockey) league. The team consists of both local and foreign players who train and play their matches in Dundalk Ice Dome which was the only permanent ice rink in Ireland (The Ice Dome was closed in early May 2010). In Kilkenny: The Landed Gentry & Aristocracy, Art Kavanagh devotes a chapter each to eighteen of the most prominent Kilkenny families, chosen 'on a random geographical basis to ensure even distribution over the entire county', as follows: Agar of Gowran, Blunden of Castle Blunden, Bryan of Jenkinstown, Butler (Lords Carrick), Butler of Maidenhall, Butler (Lords Mountgarret), Butler (Earls of Ormonde), Cuffe (Lords Desart), De Montmorency, Flood of Farmley, Langrishe of Knocktopher, Loftus of Mount Juliet, McCalmont of Mount Juliet, Ponsonby (Earls of Bessborough), Power of Kilfane, Smithwick of Kilcreene, St George of Freshford and Wandesforde of Catlecomer. ^ a b c "Sapmap Area - Settlements - Kilkenny". Census 2016. CSO. 2016. Retrieved 12 January 2018. ^ a b Room 2006. ^ "Local Government Act 2001" (PDF). Oireachtas.ie. Retrieved 23 September 2017. ^ "Kilkenny". Kilkenny Famous Landmarks. Kilkenny County Council. 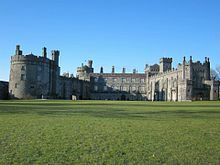 ^ "Kilkenny Living History, Loving Culture". Kilkenny Tourism. Archived from the original on 2016-03-03. ^ a b "Kilkenny Roots Festival". kilkennyroots.com. Retrieved 23 September 2017. ^ Wright, Thomas, ed. A Contemporary Narrative of the Proceedings Against Dame Alice Kyteler, Prosecuted for Sorcery in 1324, by Richard de Ledrede, Bishop of Ossory. London: The Camden Society, 1843. ^ Prim, John G. A. (1870). "The Corporation Insignia and Olden Civic State of Kilkenny". The Journal of the Royal Historical and Archaeological Association of Ireland: Fourth Series. 1 (1): 281–282. JSTOR 25506583. ^ Hayes-McCoy, G. A. (1960). "The Galway Sword and Mace". Journal of the Galway Archaeological and Historical Society. 29 (1/2): 19. JSTOR 25550099. ^ Yenne, Bill (1 Apr 2014). Beer: The Ultimate World Tour (illustrated ed.). Race Point Publishing. p. 16. ISBN 978-1-937994-41-9. Retrieved 7 July 2015. ^ DE LEDREDE, RICHARD (1842). A CONTEMPORARY NARRATIVE OF THE PROCEEDINGS AGAINST DAME ALICE KYTELER, PROSECUTED FOR SORCERY IN 1324. PARLIAMENT STREET, LONDON: JOHN BOWYER NICHOLS AND SON. ^ a b "Census for post 1821 figures". ^ "Histpop – The Online Historical Population Reports Website". ^ NISRA. "Northern Ireland Statistics and Research Agency – Census Home Page". Nisranew.nisra.gov.uk. Archived from the original on 2012-02-17. Retrieved 2010-07-07. ^ Table 5: Population of Towns ordered by County and size, 2002 and 2006. ^ "Source:County Incomes and Regional GDP 2005, CSO". ^ "Population (Number) by County, Year and Religious Denomination". CSO. ^ a b "30 Year Averages in Kilkenny 1978-2008". Met Éireann. Retrieved 13 October 2016. ^ a b c d e f g h "Kilkenny (Weather Observing Stations)". Met Éireann. Archived from the original on 2008-08-28. Retrieved 2008-09-09. ^ "Temperature in Ireland". Met Éireann. ^ a b c "About us". kilkennyweather.com. Archived from the original on 2009-10-29. ^ a b c d "Climate". kilkennyweather.com. ^ "Absolute Maximum Air Temperatures for each Month at Selected Stations" (PDF). Met Éireann. Archived from the original (PDF) on 4 March 2016. Retrieved 13 October 2016. ^ "Absolute Minimum Air Temperatures for each Month at Selected Stations" (PDF). Met Éireann. Archived from the original (PDF) on 29 January 2017. Retrieved 13 October 2016. ^ "The History of the Kilkenny Borough Council". Kilkennycity.ie. Retrieved 23 September 2017. ^ An exposed rock face can still be seen from the road. 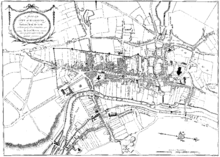 ^ "Medieval walls of Kilkenny City" (PDF). Heritagecouncil.ie. Archived from the original (PDF) on 2012-08-04. Retrieved 23 September 2017. ^ "City Walls Project". Kilkennycity.ie. Retrieved 23 September 2017. ^ "Kilkenny City Walls Conservation Plan" (PDF). Kilkennycity.ie. Retrieved 23 September 2017. ^ "Home - Kilkenny Tradfest". Kilkenny Tradfest. Retrieved 23 September 2017. ^ "Savour Kilkenny – Festival of Food – October Bank Holiday Weekend 2017". Savourkilkenny.com. Retrieved 23 September 2017. ^ "Official Rhythm & Roots Website". Kilkennyroots.com. Retrieved 23 September 2017. ^ The private theatre of Kilkenny. Books.google.ie. 2006-05-17. Retrieved 2010-08-12. ^ "Watergate Theatre official website". Watergatetheatre.com. 2010-02-13. Retrieved 2010-08-12. ^ "KCLR 96FM Official Website". Kclr96fm.com. Retrieved 23 September 2017. ^ "BCI – JNRL Figures for July 08 – June 09" (PDF). Archived from the original (PDF) on 2009-10-14. Retrieved 2009-08-20. ^ "Radio Kilkenny Website". Radiokilkenny.ie. Archived from the original on 2012-10-19. Retrieved 23 September 2017. ^ Team, Fujitsu/Oireachtas Lotus Notes/Domino Development. "Parliamentary Debates". Debates.oireachtas.ie. Retrieved 23 September 2017. ^ "The Finn's Leinster Journal Newspaper Archive 1771 - 1828". irishnewsarchive.com. Archived from the original on 25 October 2018. ^ "Home - ABC - Audit Bureau of Circulations". Abc-ireland.ie. Retrieved 23 September 2017. ^ "About Kilkenny - Media - Newspapers". Kilkenny.ie. Retrieved 25 October 2018. ^ "kilkenny library Local Studies – Photographic Collection". Kilkennylibrary.kilkenny.ie. Archived from the original on 2009-09-17. Retrieved 23 September 2017. ^ "Academy of Urbanism". Archived from the original on 2008-01-19. ^ "Irish Tidy Towns Competition" (PDF). Archived from the original (PDF) on 2016-04-19. ^ Suty, Mairie de Moret-sur-loing - O. "Liens - Site de la ville de Moret-sur-loing". Ville-moret-sur-loing.com. Retrieved 23 September 2017. ^ "Kilkenny Campus". maynoothuniversity.ie. Maynooth University. Archived from the original on 2018-11-29. Retrieved 2018-11-28. ^ "Maynooth University Kilkenny Campus". kilkenny.ie. Kilkenny County Council. Archived from the original on 2017-11-26. Retrieved 2018-11-28. ^ "Kilkenny station" (PDF). Railscot. Irish Railways. Retrieved 2007-09-05. ^ "Glanbia at a Glance". Glanbia Plc. ^ "Glanbia – Our History". About Us. Glanbia Plc. ^ "Our History". Glanbia plc. 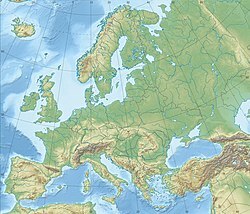 ^ "Glanbia – Our Global Footprint". Glanbia Plc. ^ "World's major Co-operatives & Mutual Businesses" (PDF). ICA Global 300 Report 2010. Intewrnational Cooperative Alliance. Archived from the original (PDF) on 2016-03-04. ^ "Top 300 co-operatives generate USD 2 trillion". World Cooperative Monitor. International Co-operative Alliance. ^ "Glanbia Archives". Kilkenny Archives. St Kieran's College, Kilkenny. ^ Ireland, CIB-Citizens Information. "Find an Address". Findaddress.citizensinformation.ie. Retrieved 23 September 2017. ^ "HSE Factfile on St Lukes General Hospital". Hse.ie. Archived from the original on 2012-02-22. Retrieved 23 September 2017. ^ "South Eastern Health Board Psychiatric Hospitals". Archived from the original on 2009-07-25. Retrieved 2009-07-23. ^ "Aut Even Private Hospital". Archived from the original on 2009-07-27. ^ a b c "Club history". Kch.ie. Archived from the original on 2011-07-21. Retrieved July 6, 2010. ^ "United we stand - Kilkenny join women's league". Kilkenny People. 11 July 2015. Retrieved 2 January 2016. ^ O'Mahony (January 17, 2009). "A proud tradition carved in Marble". herald.ie. Retrieved 8 February 2011. ^ a b c From the official website of Kilkenny RFC; see history "I". & Dermot O'Mahony. "II". ^ "Kilkenny City Storm Website". Archived from the original on August 1, 2015. ^ "Irish Ice Hockey League Recreational Division 2008 - 2009". Archived from the original on 2009-06-18. Retrieved 2009-07-16. ^ Art Kavanagh (2004). "The Landed Gentry & Aristocracy of County Kilkenny". Kilkenny. Irish Family Names. Anderson, Paris (1848). "Nooks and Corners of County Kilkenny" (PDF). Kilkenny: Kilkenny People Printing Works, James's Street. Bradley, John (2004). "The treasures of Kilkenny". Bush, Andrew; Haworth-Booth, Mark (1989). Bonnettstown: A House in Ireland. H.N. Abrams. ISBN 0-8109-0748-8. Carrigan, William (1905). "History and Antiquities of the Diocese of Ossory, Volume 1" (PDF). Dublin: Sealy, Bryers and Walker. Carrigan, William (1905). "History and Antiquities of the Diocese of Ossory, Volume 2" (PDF). Dublin: Sealy, Bryers and Walker. Carrigan, William (1905). "History and Antiquities of the Diocese of Ossory, Volume 3" (PDF). Dublin: Sealy, Bryers and Walker. Carrigan, William (1905). "History and Antiquities of the Diocese of Ossory, Volume 4" (PDF). Dublin: Sealy, Bryers and Walker. Chadwyck-Healey, Inc (1856). "Notes and Queries". University of Michigan: Oxford University Press. Clarendon. "De Ossoriensi Dioescesi". Clarendon Collection (tom. li. audit. number 4796); Trintity College, Dublin (E. 4.18). : 19–30. Corcoran, Colm. The Life and Times of Kilkenny's Citizens. Cody, Brian (3 October 2009). Cody. Kilkenny: Folens. Edwards, David (2000). The Ormond Lordship in County Kilkenny, 1515-1642: The Rise and Fall of Butler Feudal Power. Four Courts Press. ISBN 1-85182-578-9. Egan, P.M. (1884). "The illustrated guide to the city and county of Kilkenny" (PDF). Kilkenny. Fry, Plantagenet Somerset (1991). A History of Ireland: From the Earliest Times to 1922. Routledge. ISBN 0-415-04888-5. Gale, Thompson (2004). "The Statutes of Kilkenny". Encyclopedia of Irish History and Culture. 1st ed. Gleeson, John; Cunningham, George (1982). History of the Ely O'Carroll Territory Or Ancient Ormond. Roberts' Books. ISBN 0-907561-06-3. Graves, Rev. James (1857). "The History, Architecture, and Antiquities of the Cathedral Church of St. Canice, Kilkenny". Grafton Street, Dublin. : Hodges, Smith, & co.: 22. Healy, William (1893). "History and antiquities of Kilkenny (City and County). Volume 1" (PDF). Kilkenny. Hogan, John (1884). Kilkenny; the Ancient City of Ossory, the Seat of Its Kings, the See of Its Bishops and the Site of Its Cathedral. P. M. Egan. Jackson, Robert Wyse (1974). The Story of Kilkenny. Mercier Press. ISBN 0-85342-391-1. Kenny, Sean (2003). Every Stick and Stone that Stands Kilkenny. Kilkenny, Ireland: Sean Kenny. ISBN 0-9545741-0-9. Ledwich, Edward (1991). Antiquities of Ireland. Banton Press. ISBN 9781856520256. Lanigan, Katherine; Tyler, Gerald (1987). Kilkenny: Its Architecture and History. Belfast: Appletree Press. ISBN 0-86281-180-5. Leonard, John (1996). A University for Kilkenny: Plans for a Royal College in the Seventeenth Century. St Canice's Press. ISBN 0-9528076-0-2. Mayor, F White (1999). The Castle on Kilkenny. Folens. Maloney, Danny (1986). An Individuals tale of Kilkenny. Kilkenny, Ireland: Palin & Son Publishing. p. 457. Masters (1085). "Annals of the Four Masters". Meehan, C. P. (1846). "The Confederation of Kilkenny" (PDF). Dublin: James Duffy. Muldoon, James (2000). "Medieval Notions of Difference". In Lang, Berel (ed.). Race and Racism in Theory and Practice. Rowman & Littlefield. ISBN 0-8476-9693-6. O'Brien, Karen (1367). "A Statute of the Fortieth Year of King Edward III., enacted in a parliament held in Kilkenny, A.D. 1367, before Lionel Duke of Clarence, Lord Lieutenant of Ireland". Retrieved 2008-12-31. O'Carroll, Joseph C (1980). Historic Kilkenny: Kilkenny and It's Glorious Past, a Guide to Historic Kilkenny. Kilkenny People Ltd.
Room, Adrian (2006). Placenames of the World (2 ed.). McFarland & Co Inc. ISBN 978-0-7864-2248-7. Simms, Katherine (2005). "Gaelicization.". Medieval Ireland An Encyclopedia. 1st ed. Routledge. Simms, J.G (1961). Kilkenny in the Jacobite War, 1689-91. 13. Old Kilkenny Review. Sparks, May; Bligh, Eric (1926). Kilkenny: Pen and picture pages of its story (PDF). Kilkenny: Kilkenny People office. Tighe, W (1802). Statistical observations relative to the county of Kilkenny (PDF). Dublin: Graisberry and Campbell. Nolan, William; Whelan, Kevin (1990). Kilkenny:History and Society. Geography Publications (published 2005). p. 715. ISBN 0-906602-13-0. Wikimedia Commons has media related to Kilkenny. Wikivoyage has a travel guide for Kilkenny. Wikisource has the text of a 1911 Encyclopædia Britannica article about Kilkenny. "Kilkenny" Encyclopædia Britannica. 2008. Encyclopædia Britannica Online.